Okay so it’s definitely not sweater weather, at least not during daylight hours, but we refuse to allow that to dampen our fall mood! We’re here for witching season and we’ll be damned if you’re not finding your inner pumpkin spice latte. Put those final touches on your Halloween costume and come make fall a thing with us one night this week. Breezy evenings amongst the Resident firepits never felt so festive! The countdown to everyone’s favorite holiday begins tonight with perhaps the last time we hope to see you costume free as KROQ presents a show from Cleopatrick. Friday we’re partying like it’s the 80s at New Wave for the Masses. 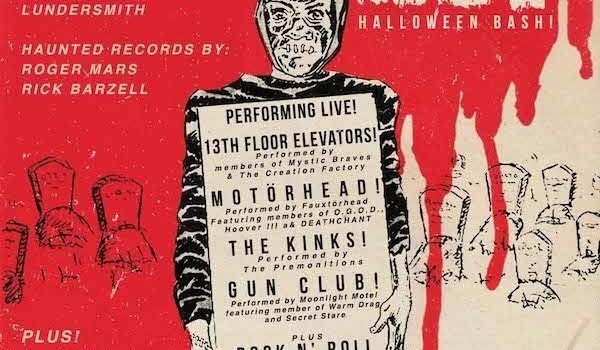 Dance to the likes of New Order, The Cure, Depeche Mode, and the gang and maybe even turn to your favorite new wave band for costume inspo. We can’t wait to see how many Robert Smith clones arrive at our doorstep! Just like heaven. Halloweekend is in full swing on Saturday with two ticketed events all day and night in both the garden and inside. First up is a festive and spooky edition of Daft Brunch from 1-7 pm featuring a lively dance floor, delectable brunch offerings, and endless opportunities for photos and fun. Last year’s costumes blew our minds and took Halloween to a whole new level — dress to impress! After a full day of Daft Punk hits, we continue the endless dance party at a very special BOOtie LA! Show off your costume at our favorite mashup party for a chance to win one of three $100 prizes — winners will be chosen in categories for Best Overall, Best Group, and Scariest costume. We can’t wait to see what you come up with. For those looking for a darker, truly creepy Halloween experience we’ve got Carrie Prom on Sunday night presented by Nance Arte (also the birthday queen for the night!). Throw on some fake blood and join us for a performance from Yegkikian and DJ sets from C-Minus and Unholy. We take a brief hiatus from the spooky festivities for a show presented by Lifted Research Group on Monday 10/29. Join us for performance from Oceanside native and hip hop artist John Givez as LRG continues their advocacy to support artists using their passions and creativity to pay rent and make a living. It’s free with RSVP, so make your move and peep this dope video while you’re at it. Next month’s calendar is filling up quickly! A first exciting highlight is the return of Voyager Institute, your favorite afternoon class meets variety show / TED Talk — don’t miss your chance to dive into an unauthorized history of local publication, LA Weekly, with commentary from former staffers on the front lines. Joining us Saturday afternoon on 11/3 for a rousing time! We’re equally excited for Big Data’s live performance on 11/6 with Castlecomer and this jam is helping us pass the time. Grab tickets before it’s too late. Production on 12/1, and the very exciting Lola Kirke with Dana Williams on 12/20. With the year coming to an end, it’s time to fill up your schedule and make sure 2018 ends on a jolly note. That’s all she wrote! Hope to see you tipsy and incognito this weekend for some fall fun. Everybody deserves the chance to dress up and get spooky.